Airliners versus adverse weather encounters appear to be increasing, with resulting damage to airframes and, in the worst cases, loss of the aeroplane and life. The increased frequency and convective violence associated with storm clouds, of late, may be associated with climate change and research on this subject continues. In recent years there have been two major accidents, both with loss of life to all on-board, in which adverse weather in the tropics has played a role. 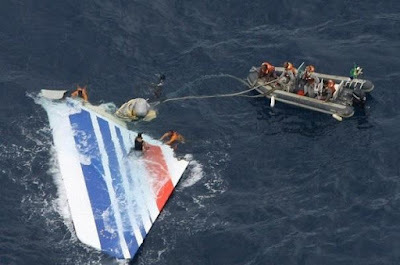 The most recent was a Swiftair MD83 on the 14th July 2014, in Mali and the other was an Air France A330 on the 1st June 2009 that crashed into the Atlantic Ocean. Adverse weather was a causal factor in both accidents. Though the aeroplane types differed, both relied on automatics for managed flight and the flight crew were experienced (heavy crew, 3 pilots on the A330). Both aeroplanes penetrated mesoscale convective systems (MCS). Both accidents were at night. Both accidents were caused by the flight crew’s inability to recover from a stall situation induced by adverse weather (Icing - ICI). Neither flight was subjected to a regulatory and administered flight watch oversight. 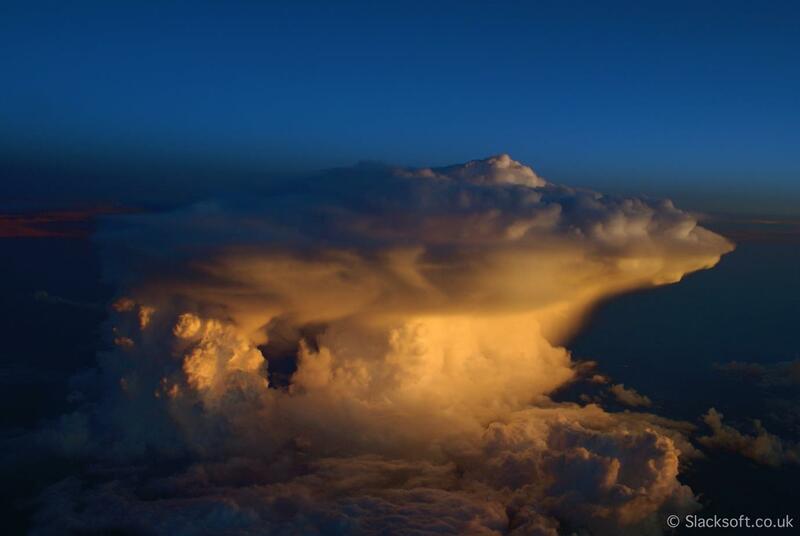 Adverse weather is a catchall for a large variety of atmospheric phenomenon that can affect the safety of a flight. These range from the relatively benign, such as fog, to the explosively energetic convective storms that are commonplace in the tropics. 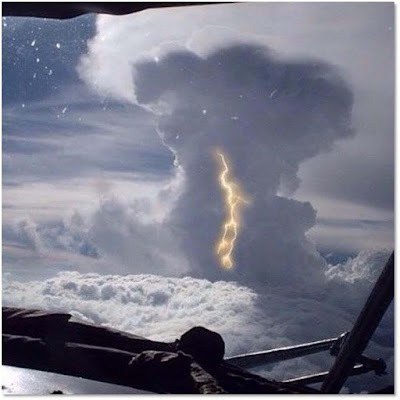 In extreme cases, these storms can produce up- and down-drafts that far exceed the climb performance of an airliner whilst their tops sometimes reach 60,000ft. 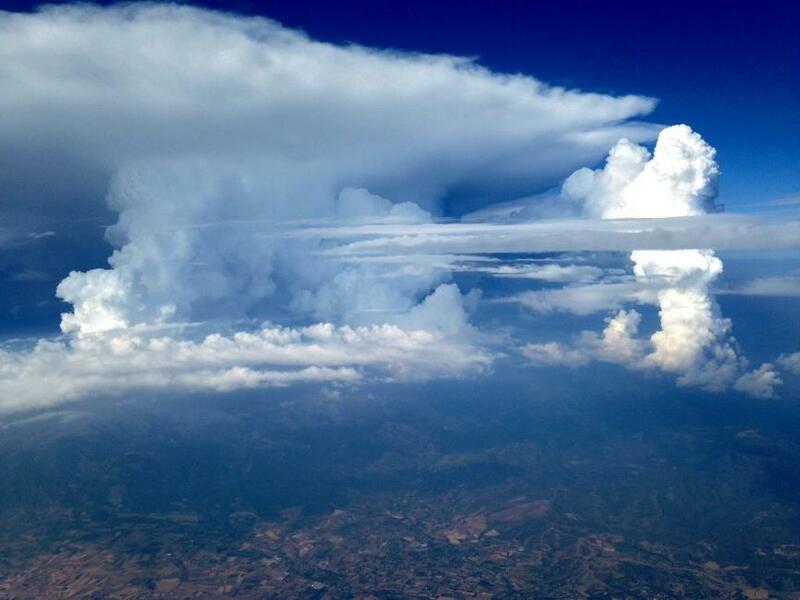 Even smaller storms that do not reach typical cruise altitudes can produce ill effects through clear air turbulence and high altitude wind shear. Successfully navigating such weather relies on a concerted effort from flight planners, Air Traffic Controllers (ATC) and the flight crew themselves. Each of these groups has access to a distinct set of experience and data: Planners will be able to access weather forecasts and observations that can indicate likely conditions along a planned route. ATC may be able to see weather radar or satellite images for their sector and they will receive reports from other aircraft that encounter adverse weather conditions. 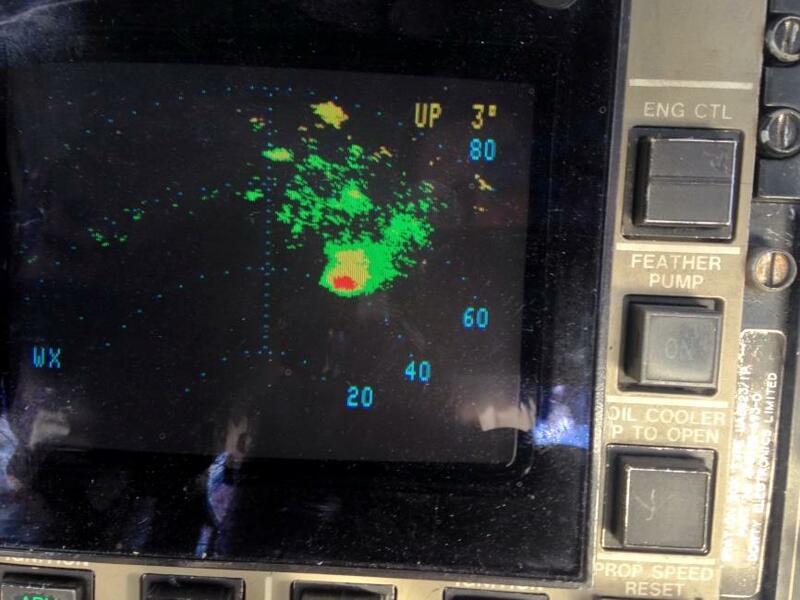 Flight crews have limited external weather information but can make direct observations of conditions using the on-board weather radar as well as simple, but often very effective, visual observations. In some cases, this safety mechanism can break down, though. Weather forecasts can be wrong, in some cases the ‘significant weather’ charts miss regions of bad weather while at other times they may show such large regions of bad weather as to be too vague to be practicable. Ground and satellite-based weather data can be out-of-date, particularly in the case of long-haul flights: The weather information used by the flight planners may be 10 hours old by the time an aircraft is close to its destination. Lastly, on-board weather radar does not always detect adverse weather: Its efficacy relies upon the flight crew correctly manipulating the radar settings to provide an optimum view of the conditions ahead. A common occurrence, particularly south of the European Alps, is for an aircraft to encounter heavy turbulence without any warning. The crew using a radar tilt setting that is too shallow, meaning that rapidly building convection is not seen by radar until the aircraft is dangerously close to it, often causes these surprise encounters. This has, in a number of cases, led to crew and passenger injuries. For some regions, such as the Alps, the problem is exacerbated by the congested airspace: Deviating to avoid bad weather may bring an aircraft too close to other traffic. Managing the dual threat posed by weather and traffic requires good communication and planning between ATC and flight crews. 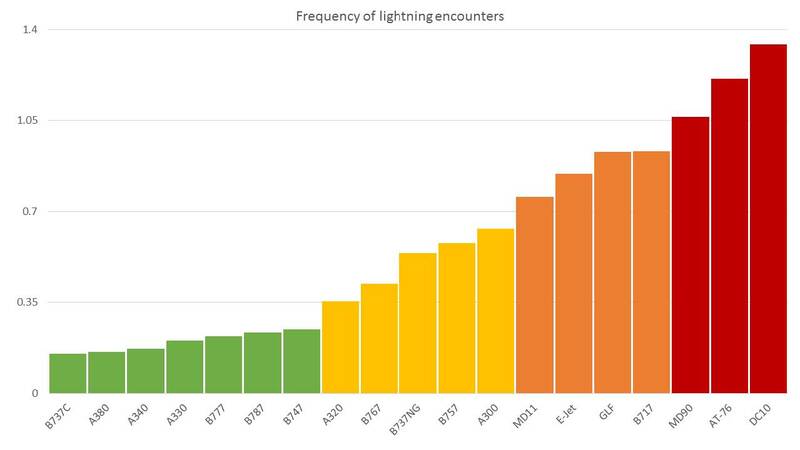 The percentage of all flights (global), subdivided by aircraft type that passed within 10km of a lightning strike. Measured during March 2014 – May 2015. Courtesy of Dr Simon Proud, AOPP, University of Oxford. A further problem is that, in some cases, convective storms can produce broad, dense, clouds composed of very small ice crystals – too small to be detected by radar. The crystals are, however, still capable of causing difficulties for the unprepared flight crew. The chain of events that resulted in the loss of Air France flight 447 began with airspeed sensors obstructed by ice crystals. Several other flights have also suffered from unreliable airspeed due to pitot tube obstruction whilst others have experienced engine difficulties caused by ice crystals building up on internal surfaces. Radar, therefore, cannot be relied upon to be a foolproof warning system for bad weather – the skill of the flight crew in manipulating its settings and interpreting the data it displays is vitally important. In flight, the only equipment pilots have at their disposal for tactical weather avoidance are the on-board weather radar and the naked eye. Radar use and interpretation is vital to flight safety. 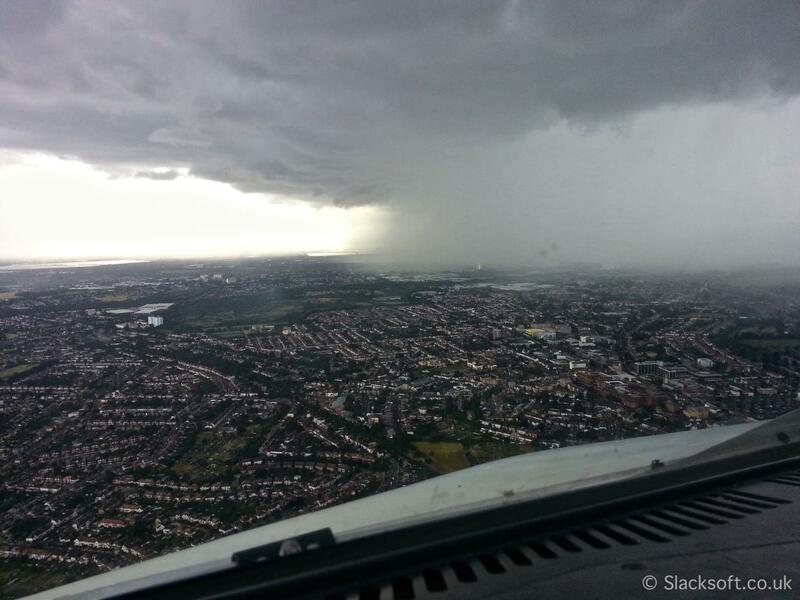 Every pilot studies the use of weather radar as part of their CPL/MPL/ATPL course. However, as technologies change, it is difficult for course syllabi to remain current. Furthermore, flight simulators are often unable to replicate the weather radar for training purposes. Consequently, pilots can be limited to the information available in aircraft manuals, instruction during training or learning by osmosis during line flying. Radars themselves are becoming more automated and it is all too easy for pilots to simply switch the device on and leave it alone. For pilots to maximise the information available for decision making and to enhance their situational awareness, they must manipulate the weather radar’s controls (tilt, gain, range etc.). The need to scan the most reflective part of convective activity, to identify where the most intense convection can be found, cannot always be left to the automatic modes of weather radars. There are some (unofficial) online resources and videos which can be used to improve pilots’ knowledge and supplement that found in operators’ literature. Ultimately, responsibility lies with individual pilots to ensure that they make the most of their on-board radars, know how to use the equipment installed and understand how to interpret the information presented to them. In the absence of formal training or recurrent training, this may only be possible through regular in-flight practice. Just as important, is understanding the limitations of the fitted equipment; there are two main issues. Firstly, the low reflectivity of ice crystals and hail can make weather detection difficult at high altitude. It is essential to scan the ‘wet’ part of a convective system – which will be found much lower down – to identify the most active regions. But, it must also be understood that speckled green returns at high altitude can indicate dangerous conditions with ice crystals, hail and turbulence. Secondly, appropriate use of the radar’s range and an appreciation of signal attenuation are vital in ensuring that pilots do not fly down ‘blind alleys’ or mis-identify ‘hidden’ areas of convection behind other areas of activity. Using this information, pilots should apply the recommended lateral separation which, depending on altitude, can be many tens of nautical miles and should, ideally, be upwind. The future should see enhanced strategic and tactical tools becoming available to crews via Operational Control and Supervision (OCS) and live weather data streamed direct to the flight deck. Finally, if all strategic (flight planning/flight watch) and tactical (radar/live data/visual) measures fail, pilots may have to resort to mitigating the effects of adverse weather. We have seen recent incidents of large transport aircraft suffering Loss of Control In-flight (LOC-I). It is essential that all pilots are familiar with the required responses. However, as the AF447 accident shows, there is still a place for ‘sitting on our hands’; notwithstanding the turbulence, when the unreliable airspeed indications first manifested themselves, simply maintaining the datum pitch attitude and thrust setting for level flight may have kept the aircraft flying safely until the checklist allowed the crew to diagnose the problem. In time, the fidelity of flight simulators will improve and meaningful upset training should become possible. In the ‘bizjet’ community, some organisations are already using small, ex-military, swept wing aircraft to train and refresh upset recoveries. Recently, the FAA mandated recurrent upset training for commercial pilots and EASA are currently going through a rule making process to do the same. This will likely require simulator software to be updated and will take time but, as recent incidents show, the single most important element in avoiding LOC-I is avoiding or exiting the aerodynamic stall. In the last few years, the manufacturers of large commercial transport aircraft have updated their advice and procedures. In terms of the stall, this is best achieved by prompt, positive action to unload the wing. Furthermore, in the case of underwing engines, thrust is not used initially due to the pitch effect and risk of a secondary stall. More generally, current upset recovery advice should be familiar to all pilots from their basic training. All aircraft have their own type-specific procedures and characteristics but the essence is to unload the wings if necessary, roll wings level and recover to level flight; thrust or power is used as appropriate. Pilots must have a comprehensive knowledge of radar use, radar limitations, aircraft performance datums and basic recovery techniques to ensure safe flight in the dynamic and energetic atmosphere in which we operate. The accidents involving AF447 and AH5017 flights could have been averted if European operators were required to comply with vigorous and vigilant operational control and supervision methodologies. Under these two headings requirements for the safety of a flight are planned and supervised by qualified people on the ground. This includes, but is not exhaustive; the assessments of airworthiness, fuel requirements (RCF as applicable), weather observed and forecast, performance, crew fitness and avoidance of fatigue, NOTAM and ATM liaison. This oversight augments the safety of a flight and assists the commander of a flight in his decision making; it does not override any decision made by the aeroplane commander. 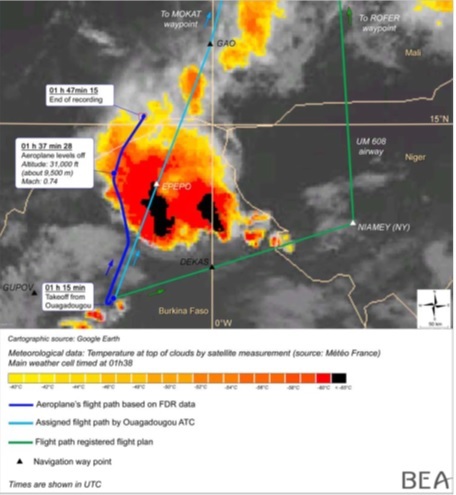 If we look at the case of AF447, active flight watch, of a flight planned to transit the Inter Tropical Convergence Zone (ITCZ), could have alerted the crew to an encounter with adverse weather of extreme convectivity on their planned route, by ground based personnel. In the case of AH5017 the departure routing (SID) was changed by the Ouagadougou controller from the planned Niamey (NY) ROFER, to EPOPO GAO. This routed AH5017 into the teeth of a mesoscale convective system and though radar was used to guide the flight around a highly convective storm cell, the proximity of the deviation was insufficient to avert aerodynamic upset caused by it. Had this flight been subject to a flight release system the route alteration could not have been allowed without approval of the operational control centre (Flight Dispatch). (a) ORO.GEN.110(c) does not imply a requirement for licensed flight dispatchers or a full flight watch system. It is an irony that EASA opinion 01/2014 “Amendment of requirements for flight recorders and underwater locating devices” concerns the detection of the CVFDR post-crash, yet there is no concern at the lack of supervision methodologies that could potentially avert the loss of a flight as well as track the actual position of it, at a minimum of 15 minute intervals. AF447 was lost for two years under the South Atlantic Ocean and AH5027 was lost for 23 hours in the Saharan Desert; MH370 is still missing since the 8th March 2014. There have recently been some high profile incidents and accidents in which adverse weather encounters were or may have been a contributory factor. For operators and pilots to be able to make sound judgements about the optimum course of action when faced with severe weather, they need a multi-layered defence system consisting of strategic (flight planning/flight watch), tactical (weather radar/live data/ATC) and, as a last resort, physical (visual) mitigations. For crews, regular recurrent weather radar training might improve confidence in using this valuable tool and also situational awareness when confronted with adverse weather encounters. The radar is far from a ‘turnkey solution’ and requires an enhanced knowledge about the specific radar and its use in terms of optimum settings to correctly interrogate and interpret the weather display. It is also vitally important that the limitations of the radar are trained and updated as technologies improve. Also placing more emphasis on traditional pilot handling skills, both in basic training and in recurrent and initial type conversion, would be of value if a crew were to find themselves with an in-flight upset following a weather encounter. Current EU regulations make for lightweight operational control and supervision. Improved operational oversight, similar to FAR Part 121, is a thorough means to provide up-to-date weather information, perhaps via the ACARS, which is of particular relevance for long-haul flights where the weather in-flight may be significantly different from the planning forecasts. Furthermore, this method of operational oversight might also be of benefit in the worst-case of a ‘lost’ flight in finding the most likely location to begin a search. With airspace becoming ever-more-congested it is possible that weather encounters may increase, in part due to lack of alternative routings. We consider that greater operational oversight along with enhanced pilot training may go some way towards mitigating this risk.